Is this an out-there celebrity baby name, or a modern virtue pick that signals achievement? 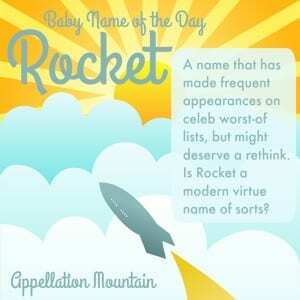 Our Celebrity Baby Name of the Day is Rocket. Australian actor Sam Worthington and wife Lara Bingle welcomed a son named Rocket Zot in March 2015. They’re not the first to choose the name, and Rocket has made crazy celebrity baby name lists before. But Lara lashed out at a journalist who criticized her son’s name, explaining that Zot was her late father’s nickname. I can’t find an interview where she discussed Rocket specifically. Pharrell Williams – another high profile celebrity with a son by the name – did offer an explanation for why he and wife Helen Lasichanh made the choice in an interview with Oprah. More on that later. There’s one more famous family that includes a Rocket. Director Robert Rodriguez and ex-wife Elizabeth Avellan are parents to Rocket, Racer, Rebel, Rogue, and Rhiannon. Their eldest was born back in 1995, so the Rodriguez family was way ahead of the trend! 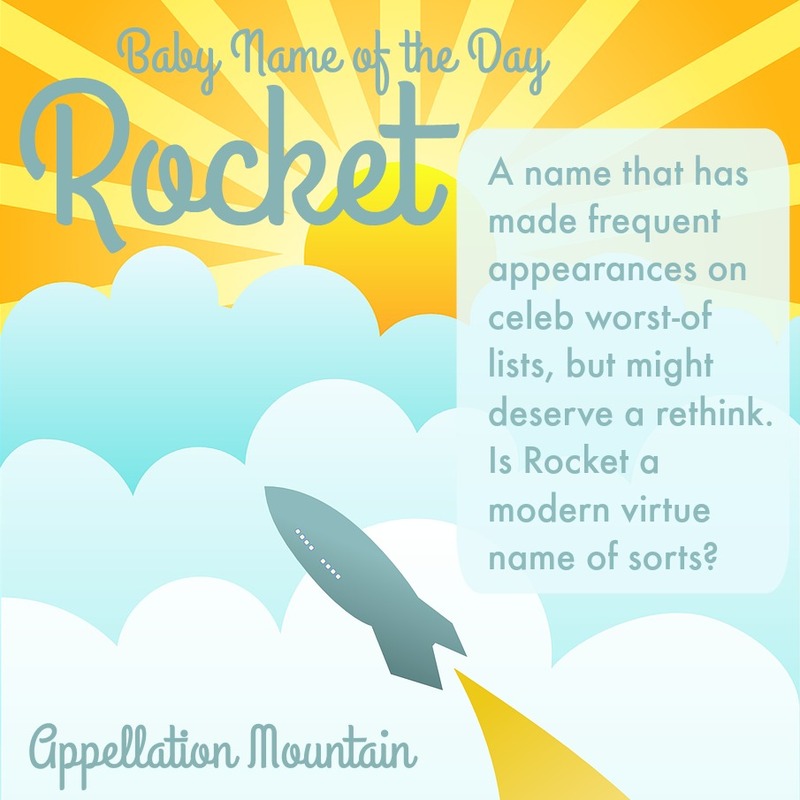 Before it was a celebrity baby name choice, rocket was simply a word. It comes from the Italian rocchetto, originally a word for a spindle, because of its shape. In many ways, it’s a very twentieth century word. It first appears in the modern sense in Popular Science magazine in 1927 – less than one hundred years ago! Of course, rockets themselves aren’t new. 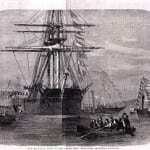 They were used during the Napoleonic Wars, as well as the War of 1812. Francis Scott Key famously wrote of “the rockets’ red glare” during the Battle of Baltimore in 1814, and now we sing about them in the United States’ national anthem. The concept is even older. The Chinese were using them for fireworks by the 1200s, and possibly earlier. Today we tend to think of rockets as heading to the moon, even though the spacecraft of today have evolved considerably. Jules Verne and HG Wells imagined it. Scientists worked to make it reality, including engineer Robert Goddard. Goddard would go on to build and launch the first liquid fuel-powered rocket. His work was dismissed and mocked by the mainstream media, but ultimately ushered in the Space Age. Today the Goddard Space Flight Center is one of NASA’s major research facilities. The technology is still used in weapons, but we tend to use different words, like missile, in those contexts. None of this exactly translates into a baby name, does it? But in Pharrell’s Oprah interview, he explained that the name had two meanings. First, it was a nod to songs written by Elton John, Stevie Wonder, and Herbie Hancock. Could Rocket be a modern virtue name? While the name isn’t soaring in use yet, it’s rising – slightly. Six boys were given the name in 2001, 18 in 2011, and 13 in 2014. Seven girls were given the name in 2014, too. Overall, Pharrell’s explanation is compelling, and it’s easy to imagine more parents seeking bold names for boys considering Rocket. What do you think of Rocket? Do you think it counts as a modern virtue name, or does that only work for Pharrell? 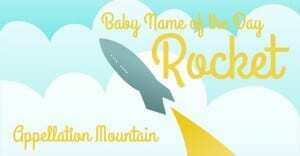 We named our daughter Rocket. The reasons overlap with Pharrell’s explanation. I’d also add that we wanted a name that didn’t tie to a specific ethnic tradition, and we are not religious. Our daughter is multicultural, and we preferred a name that spoke to our modern cosmopolitan values of progress, science, and wonder at humanity’s interaction with the natural world. We also wanted a name that was memorable and easy to spell. I do worry a lot about ways it might be difficult for her, because signaling an identifiable cultural/ethnic tribe is something that names do, and there will be times that she might prefer that to our more cosmopolitan values. It can also have a phallic connotation for some people, because of the shape of a rocket. We like the gender ambiguity for similar reasons to why we like multiculturalism of it, but of course she may have other opinions. Because it is such an out-there name we expect she may use nicknames or alternate names at different times in her life. I think that’s a good way to signal and think about how one’s identity evolves, but of course we also hope she has a strong sense of continuity of self even if she doesn’t always use the same name. 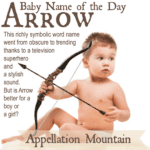 It has been a tremendously fun name for the toddler years. Whether adolescence or adulthood will precipitate a shift to Rory, Kit, Roxy, Racquel, Rachel, or something else entirely only time will tell! Thank you so much for your thoughtful comment. You’re so right about the positives of novel names – they come without preconceived notions, which can feel like the right choice for many reasons. The full names of Rodriguez’s original Spy Kids are Juni Rocket Racer Rebel Cortez and Carmen Elizabeth Juanita Echo Sky Brava Cortez. Rocket Man is a classic song by Elton John (https://www.youtube.com/watch?v=FCf23ZTFaDM). I like how Pharrell’s explanation emphasizes ingenuity (“man-made machine”) and progress (“meant to go up”) as opposed to the too-cool-for-school factor of being named Rocket. I’ve always been so-so on this name, but his interpretation makes me like it a bit more.